Yesterday, my wife and I arrived in Montreal 2:30 and pretty much hit the ground running. We took VIA Rail, 1st class from Toronto to Montreal, hoping to alleviate as much stress as possible and let someone else do the driving. This time, I’ve decided to take a different approach. My previous two times at the festival were stressful for me and I was bound and determined to just have a good time. I just want to let go and let God. Let the universe guide me and not the other way around. We both hopped into a cab and the driver took us to the wrong hotel. So far, so good. My plan is working. I started working on my 11 minute set at the Improv in Cleveland three months ago. I was wondering, how am I going to come up with 11 killer minutes of material? Ten weeks later, I’m wondering, how am I going to cut 8 minutes from my 19 minute set? Not a bad problem to have when you think about it. I remember meeting him at The Nest a year or two ago and I gave him a DVD. He told me he was a big fan and gave me a free t-shirt. Alright! SWAG! 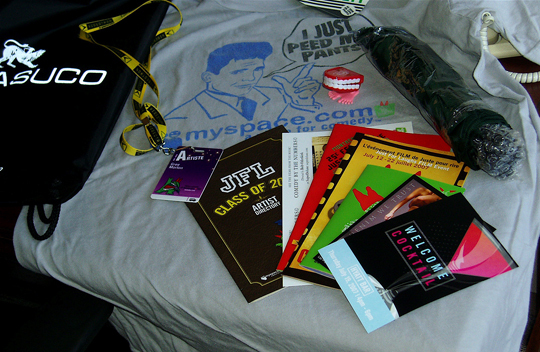 Next, I ran into my manager, Tony Camacho who handed me my schedule and swag bag which contained an umbrella, walking wind up false teeth, a map of Montreal, an artist directory to help my failing short term memory and another t-shirt. Sweet! More SWAG! I’ve been here a matter of minutes and my wardrobe has already increased.